Celebrate the Army’s 244th birthday and remember the 75th Anniversary of D Day. We’ll celebrate the Army’s 244th birthday with fine dining, top notch entertainment, and inspirational words from some of our most senior leaders. All just steps away from Tampa Harbor. You can register now by filling out the form on the right. Or scroll down to see the complete schedule of events. We look forward to seeing you there. Set in the heart of bustling downtown Tampa, Florida, the contemporary Hilton Tampa Downtown will be the site of the AUSA Celebration Honoring the 244th Birthday of US Army. The Hilton is the 2016 TripAdvisor Certificate of Excellence Award recipient. It includes a rooftop swimming pool, whirlpool and sundeck, 24-hour fitness center, 211 Restaurant and Lounge, and a Starbucks café. The Hilton Tampa Downtown hotel rooms are designed with comfort and convenience in mind, providing a place to unwind or to catch up on work. Explore the various types of rooms and amenities, and choose the space that’s right for you. The Tampa Army Ball Committee is pleased to announce that they have reserved a number of rooms at the Hilton Tampa Downtown. 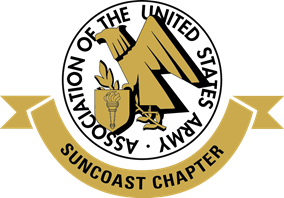 Our keynote speaker for the AUSA Celebration Honoring the 244th Birthday of US Army will be announced soon. Where is the Army Ball? When is the Army Ball? The event is Saturday, June 8th, 2019. The event begins at 1800-1900 Cocktail and Social Hour. Formal Ceremony goes from 1900 till 2100. Dancing 2100-2400. What should I wear to the Army Ball? Dress Blues, Dress Mess, or service equivalent. Black tie / formal evening wear. You can expect top-notch dining and entertainment this year. Dinner will be a multi-course meal with a selection of the chef’s custom plated beef and chicken, or vegetarian entrees. Dinner will include salads, rolls, and coffee.